A moment in meeting for worship—neither silent nor spoken—says everything about the George School community for Jayde. Describe a moment that revealed the real George School. Last year in meeting for worship, a bird got trapped inside the meetinghouse. The frustrated bird flew into window after window. Finally, the bird found its way through the open door. The silence was broken with applause, demonstrating the level of compassion that exists on campus. What lesson from George School has stuck with you? Through the George School environment, I’ve learned what a true community should look like. It has inspired me to bring its infectious energy wherever I go. 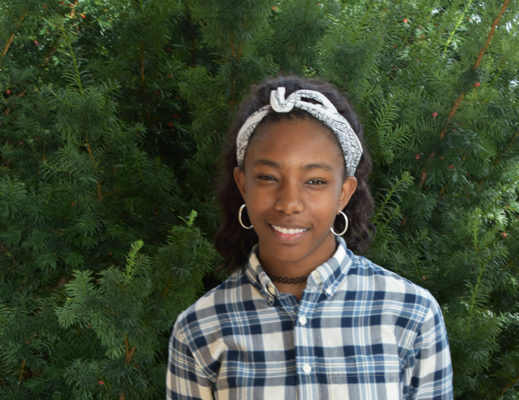 Volleyball captain and leader of the GS Slam club (a club for spoken word poetry), Jayde is involved in Model UN, UMOJA (a club that shares the culture and heritage of descendants from Africa with the George School community), and the Body Project, too. She is also on the prom committee for her class.